← Help, the Loonies are taking over the Asylum! 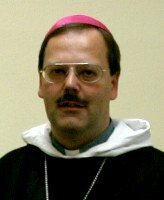 I have just received the news that Dom Klaus Schlapps of the Abbey of Saint Severin in Germany died yesterday afternoon of a heart attack. This community had recently been accepted as a part of the Nordic Catholic Church and the Union of Scranton by Bishop Roald Flemestad. He was born on September 30th 1959 and died on Sunday January 20th 2013, and therefore was only 53 years of age. I am sure that this monastic community would be grateful for our prayers for their future and for Dom Klaus. If you wish, it is possible to leave messages of sympathy on their Facebook page. This entry was posted in Uncategorized and tagged Independent / Old Catholicism, Nordic Catholic Church, Prayer intentions. Bookmark the permalink.